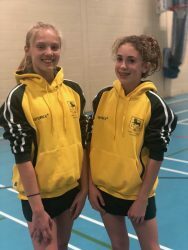 Many congratulations to Lauren and Eva, currently in Form 6, who have been selected to join the Surrey Netball Satellite Academy, after coming in the top 44 girls out of c.450 who participated in the trials. After four trial sessions at Epsom, followed by a tough day of trials at Cranleigh, Lauren and Eva have been invited to attend the Thursday Satellite Academy, held at Nonsuch School in Cheam. The Academy programme is for talented athletes between the ages of 11-13 who have demonstrated a degree of potential to Engand Talent Scouts. Lauren and Eva will attend training sessions most Thursdays for two hours after school and on Sundays once a month for three hours. The Academy will give them individual coaching support and they will also be invited to a Surrey Academy day in January. Alison Jolly, Director of Sport, says “We are very proud of what the girls have achieved. This is great news and it is well-deserved”.